Layout Description: My layout is N gauge and is a work in progress. It's not based on any real location and I intend to run a variety of trains i.e. American, Japanese and British. It will be strictly for fun. It's my first attempt at a layout and progress is slow. 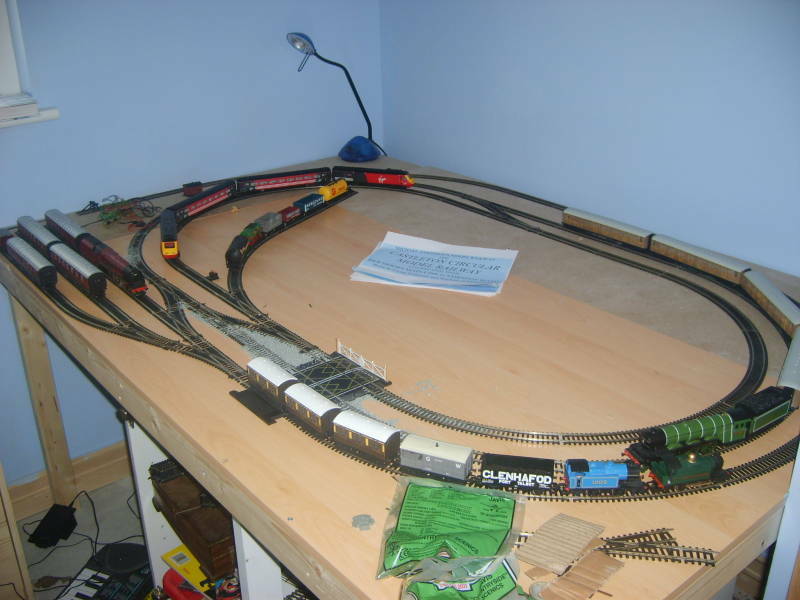 Layout Description - My layout is a single circuit around the loft, the main features are: urpeth TMD and urpeth station. 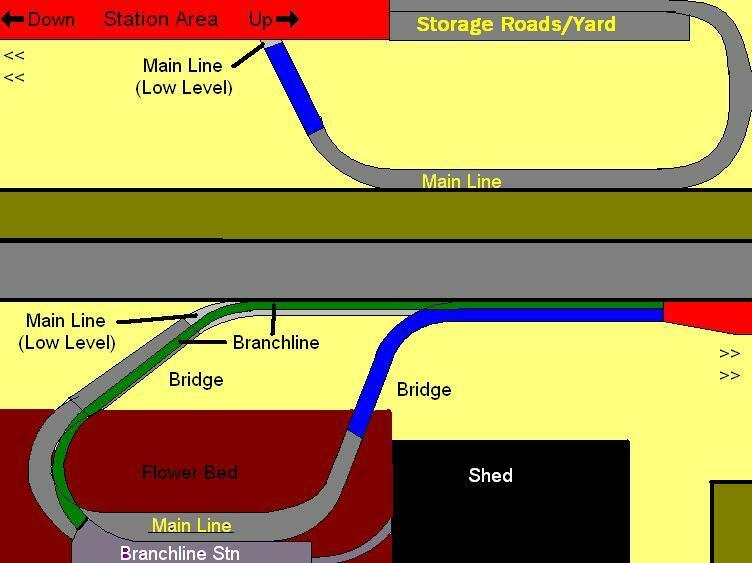 There are a couple of sidings and loops on the main line and there is 2 tunnels. 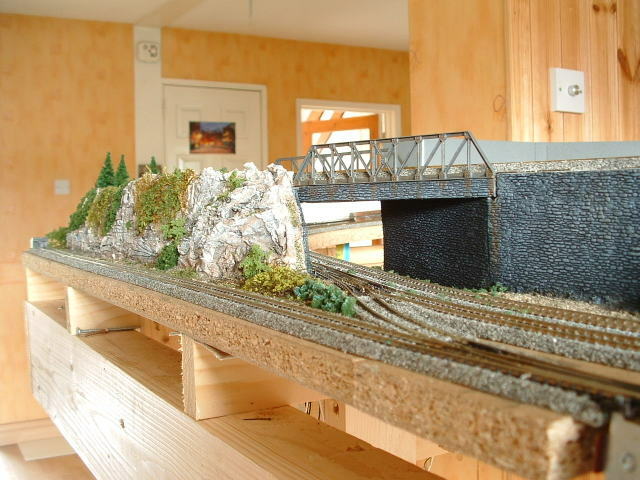 Layout Description: Park hill is in the mid50s to mid 60s somewhere out in the country side its spans over 24.5 ft long and is my first ever attempt at model railway I needed something to do after becoming disabled. 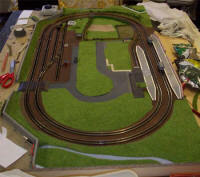 Layout Description: My layout is a garden railway in '00' with a run of around 35 yards (a touch over 1.5 scale miles). 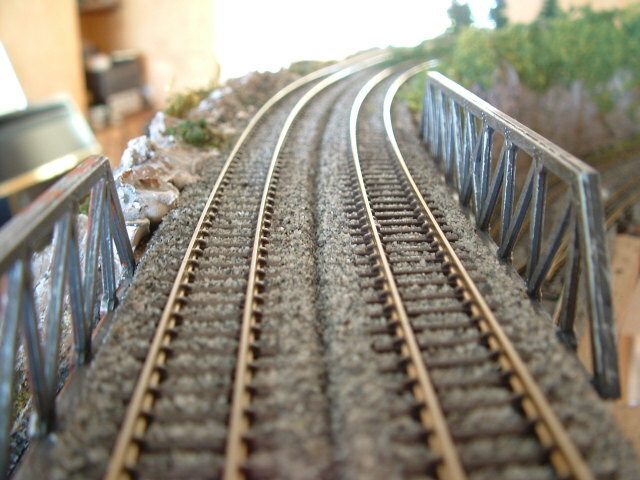 It features a double track main line loop and is structurally about 25 feet from completion at time of writing. The next section to be built will be the 5-platform station area. This section sits above the return tracks that are on a now completed lower level section, incorporating a holding loop in each direction. 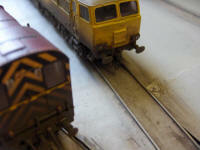 There will also be a branch line and a mail loop for my two operating mail coaches. The stock I run stretches from pre-Second World War up to around 1980. I hope to be able to run the first complete loop by April, though recent financial pressures have made this far from a straightforward exercise! My layout doesn't have a set time or place - i see a train, i buy it and run it. 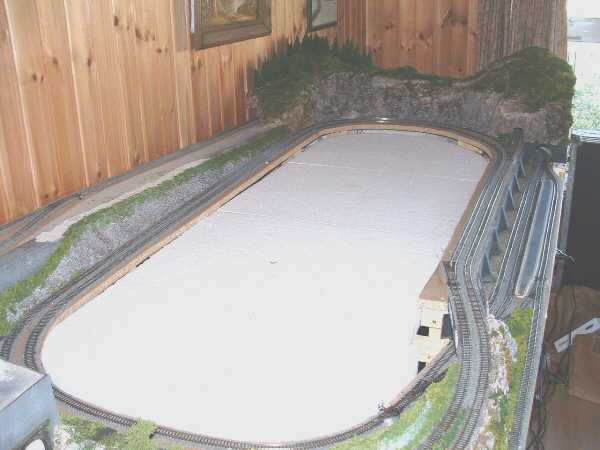 It is about 4 X 6 ft OO gauge and has two outer loops and a figure of eight in the middle. It does not have a baseboard yet but am hoping to get one when i get the room. I have four loco's and it runs on DC, but hoping to convert to DCC when I get the money/can be bothered. 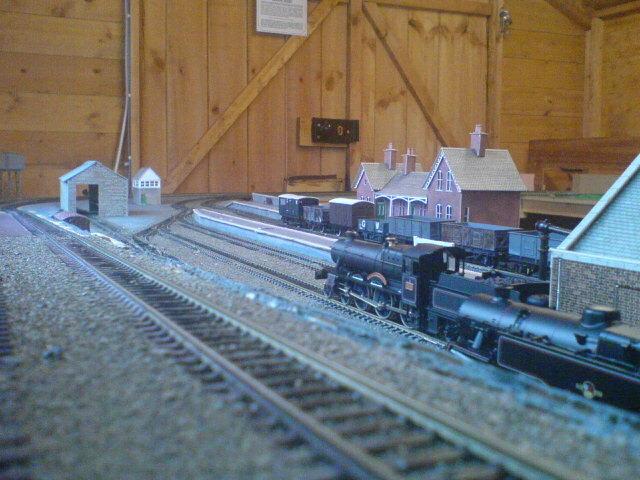 Layout Description: My layout is in a 10'x8' shed. I'm attempting to model the Cambrian Railways of Mid Wales in the late 1950s/early 1960s. Am getting there slowly with it! Description of new Layout: Torsley village MkII. A Hub where many trains from different areas meet. 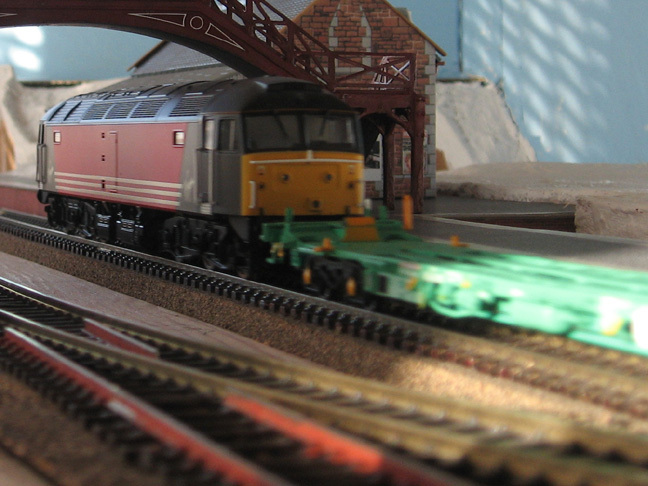 Featuring a large TMD. Station or two and Modern image Locos and rolling stock. 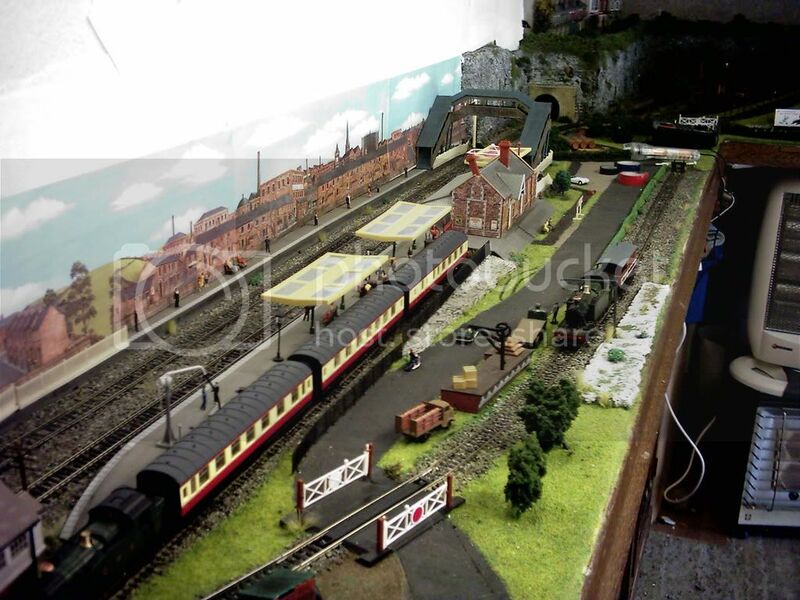 Description: Maidenfield Railway is a modern image (1990-Present) 00 layout set in the Thames Valley somewhere between Didcot and Paddington. It is 12ft x 8ft and features over 150ft of Peco Code 100 flexitrack. 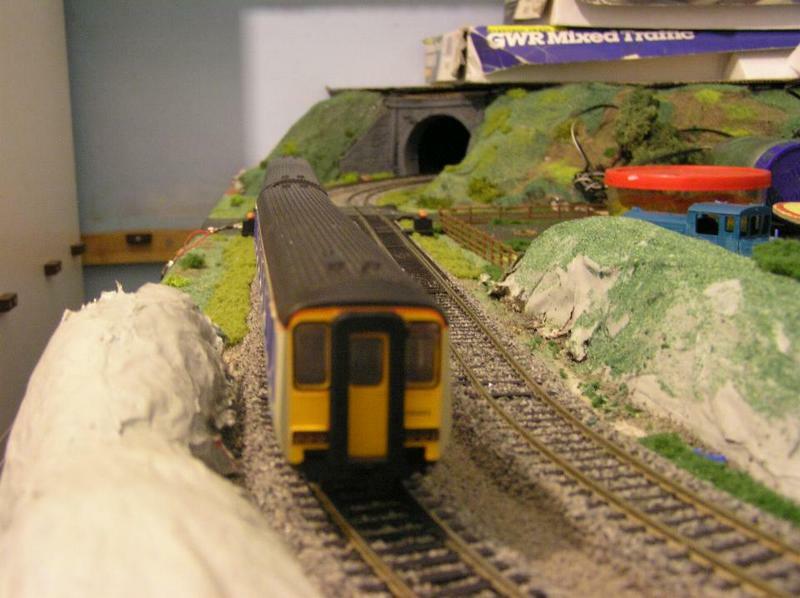 Frequent workings include Class 166 "Turbo" DMUs, several HSTs and plenty of FGW and Virgin traffic. It will eventually be controlled via DCC. 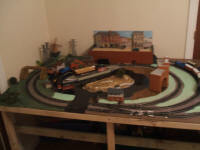 Description: Atkinston is a layout that is still in the basic stages. It runs anything from 1920s/30s steam locomotives, through to the last days of steam, early diesels, 1970s and modern. Yes, it runs whatever I want it to run! At the moment, stock present are Flying Scotsman, Duchess of Sutherland, 101, 1203 and Virgin HST. 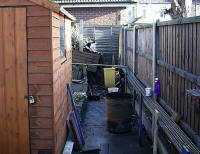 It is based in a busy industrial town, much like Rochdale and Bolton. Station with three tracks and two platforms, one is an island platform. Based on the Hornby TrakMat but modified to my tastes. Please note, the picture shows a third siding on the edge of the board at the front, this is not present anymore. New picture coming soon. Description: Freelance 00 gauge garden railway running mainly mainline steam from the late steam/early diesel era, as a preserved line so that I can run what I want, when I want to. 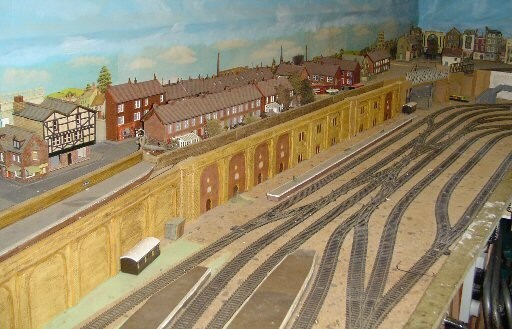 Layout Description: Bailson Town--A double loop with sidings and station, dcc controlled mainly Thomas and friends for my son. 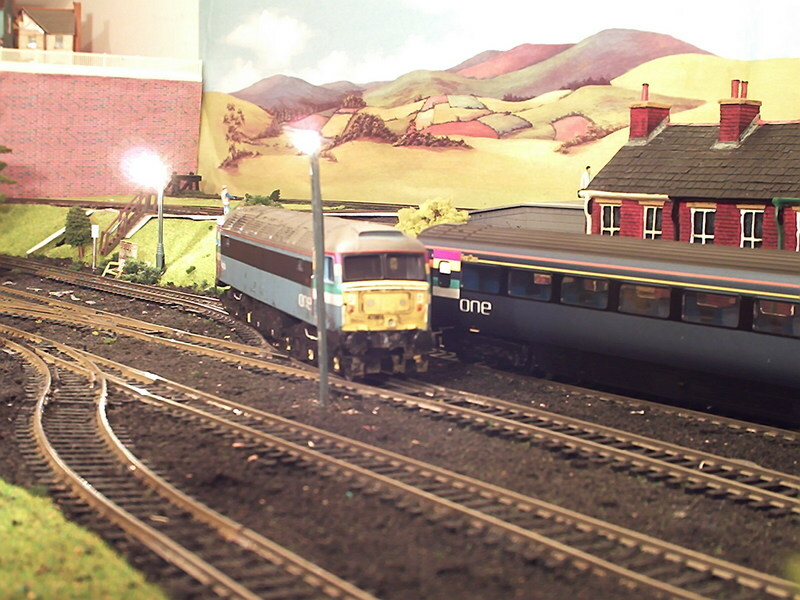 A large OO scale layout (15ft by 10ft) based on the North Wales Coast line in the early 80s BR blue period. 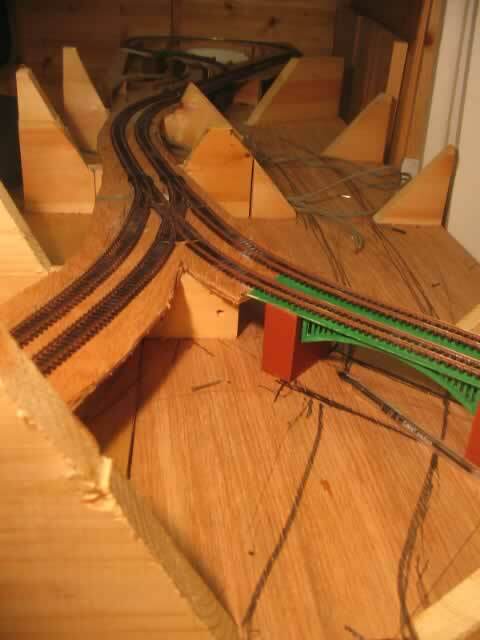 The layout features Conwy Castle and the Stephenson tubular bridge and has 2 main lines and 2 branch lines. 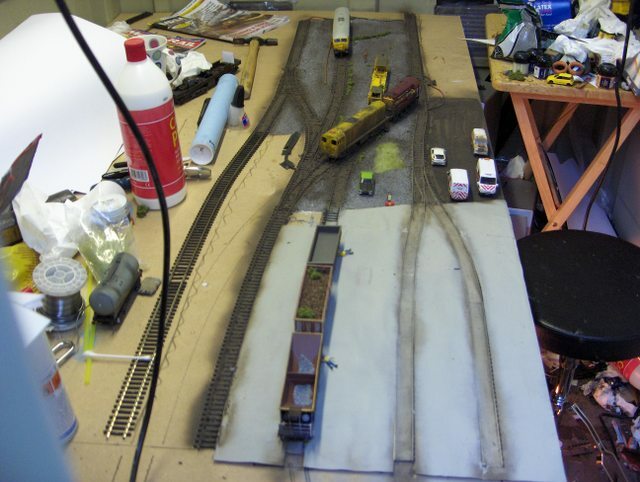 The layout was started in April 2006 and I would say it's about 70% complete (Feb 2007). 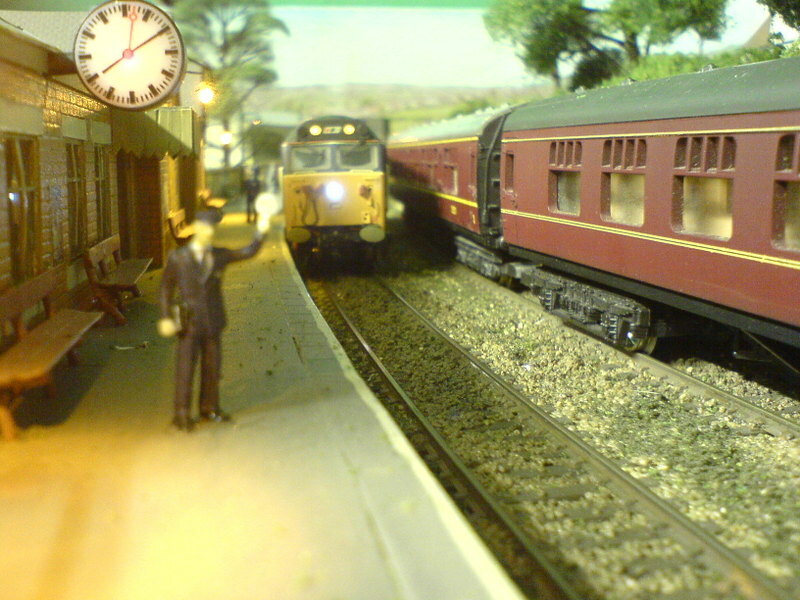 Layout Description: A fictional single-track branch line in Northants. It is modern-image and was saved from Beeching and survives to the present. Trains include diverted Virgin XC services, freight and an hourly commuter service from Northampton and Birmingham. The layout is set in 2002-2003. Layout Description: Fyncham Green. Double track, 4ft x 2ft, in N Gauge. 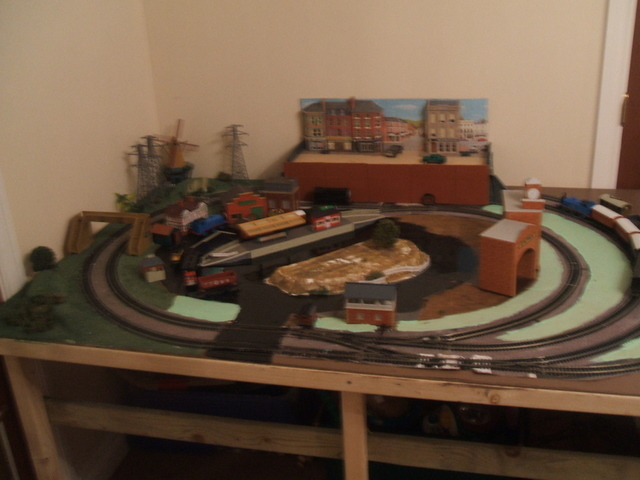 Layout Description: Layout set during the early 1990's in the North East under the last years of BR. 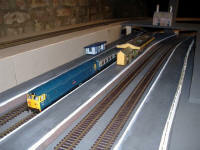 Layout Description: Eastfield North is a OO gauge Eastfield-based Scottish layout. 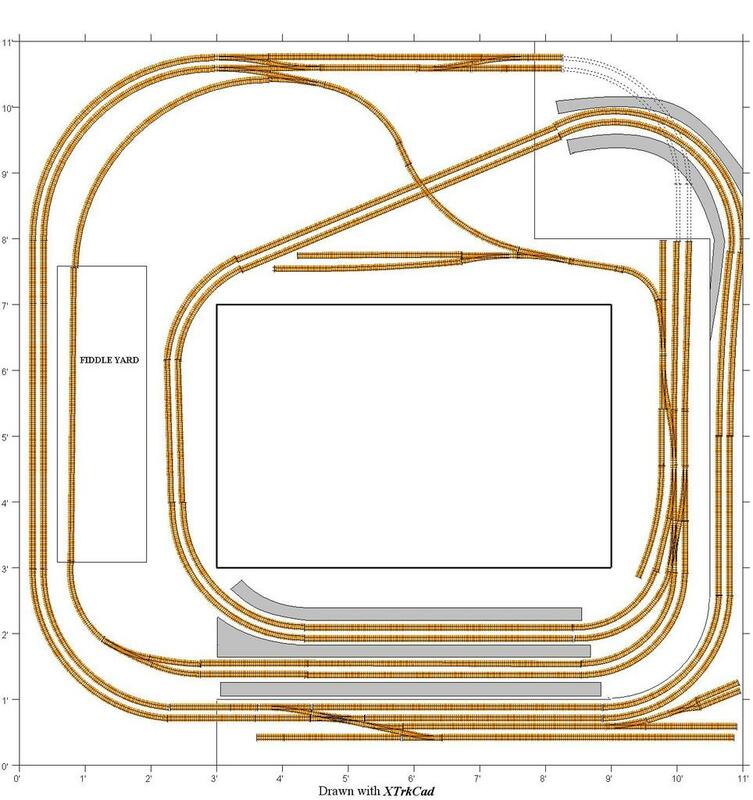 Layout Description: Pawford is a 00 layout 16ft x 8ft L shaped, it consists of 2 main line loops with 6 hidden sidings along with a branch line loop, all servicing the docks, 3 goods yards and a MPD. Traffic is mixed goods and passenger services. The layout can be run automatically or manually it is DC controlled. All track work is completed scenery is about 50% completed, there are several videos of it in action that can be viewed via the personal thread. 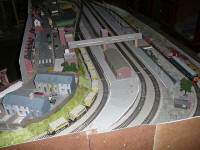 Layout Description: Masters Way is a DCC operated small servicing point situated somewhere in Crewe. Masters Way consists of some servicing points , stabling points, wagon servicing points and a 2 road fueling point. The layout is modern image allowing all sorts of rolling stock to appear. Masters Way is home to lots of unique stock. The layout is currently under construction. A fiddle yard will be added soon. 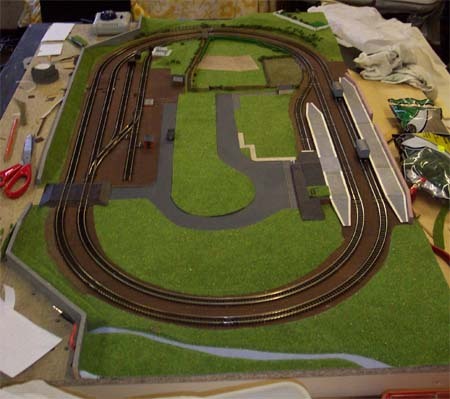 Layout Description: Flaxengate Model Railway is an N gauge 6' by 1.5' layout currently under construction. 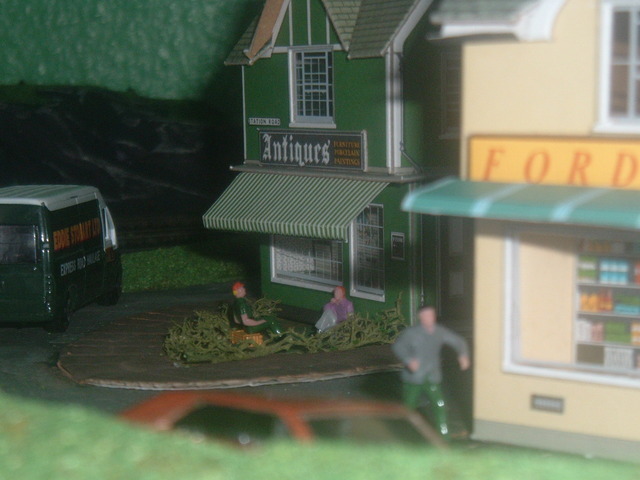 It's based in the present day and the location is fictional, but is based on a industrial town in a valley. 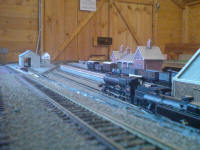 Layout Description: Freelance 00 gauge attic layout. Inverted 2 line figure 8 track plan going round the loft with an operating well in the middle, as long as i don't fall down the loft hatch. 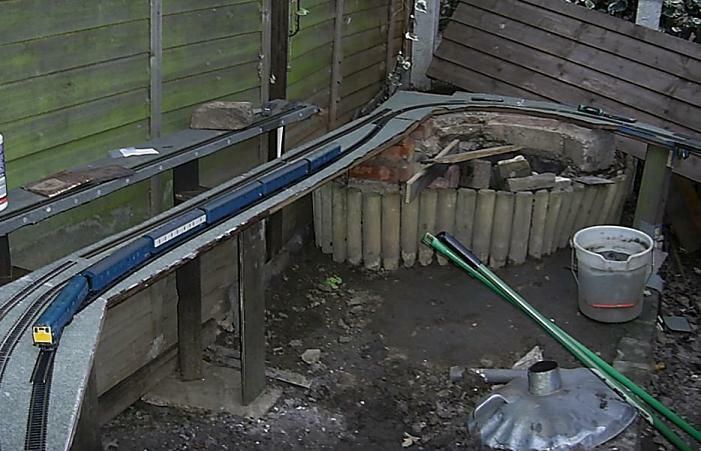 Layout Description: Lee is building his layout in a shed. It has 2 levels and is in a horse shoe shape. He has laid his track and has started to work on the scenery. 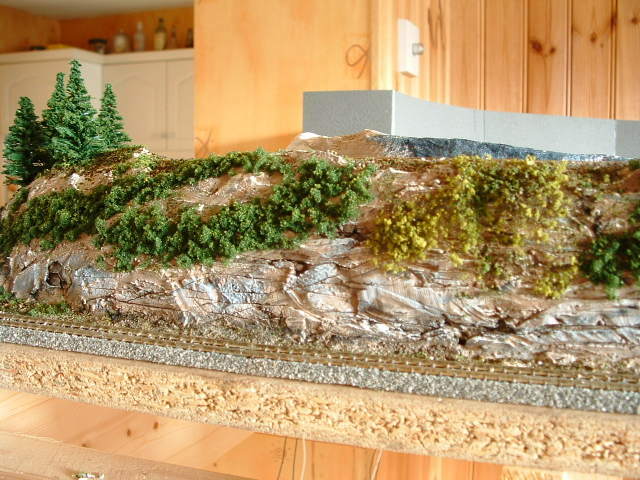 He has used polystyrene to build up the levels which he has shaped to form hills and rocky outcrops. 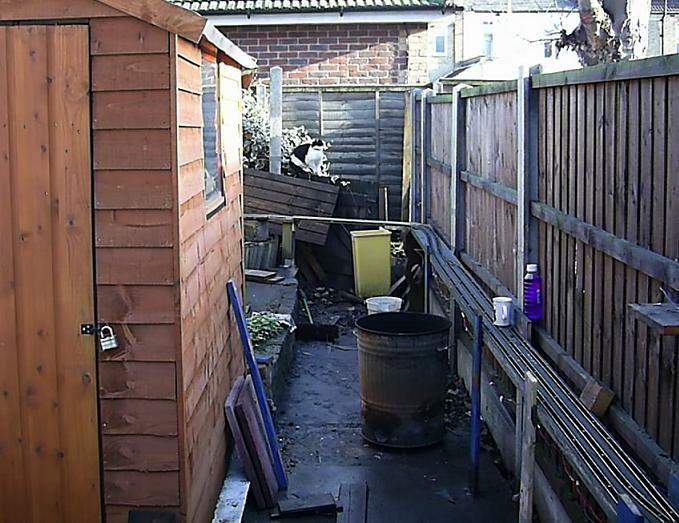 He is considering added a hinged section at the front to allow access to the rest of his shed. 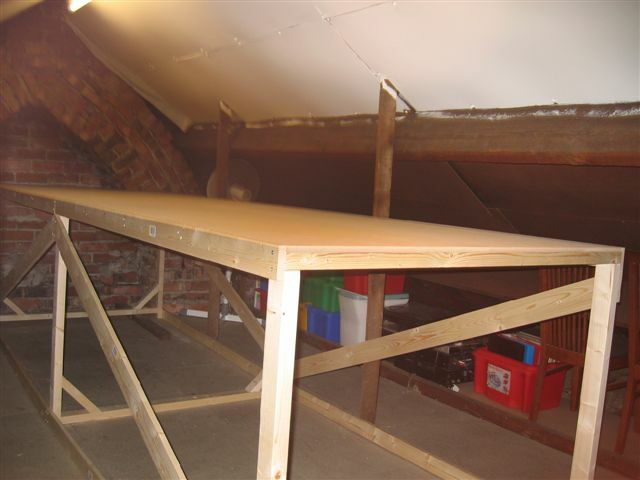 Layout Description: Phil's is building his layout in the attic. 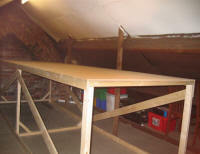 He has constructed his baseboard which is 12 x 4 feet and a metre high. For his track layout he has decided on a modified version of Peco track plan 4. It will be elongated and in filled with a goods yard. 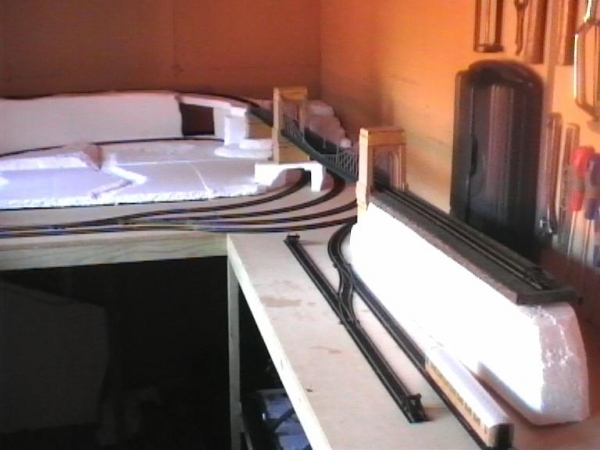 There will also be a passing loop on the bottom section of the layout. 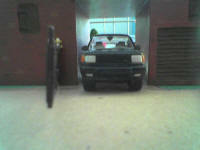 It is to be constructed using mainly Peco flexi track. Layout Description: Sean has built a very simple and small model railway layout. His layout is one to be played with and well suited to younger modellers.